Patrick Street branch is in the heart of the city of Cork and is home to a wide range of different communities – local residents, start-ups, small businesses, large companies and charities. Our new branch offers everyone a place to work, meet and support each other. 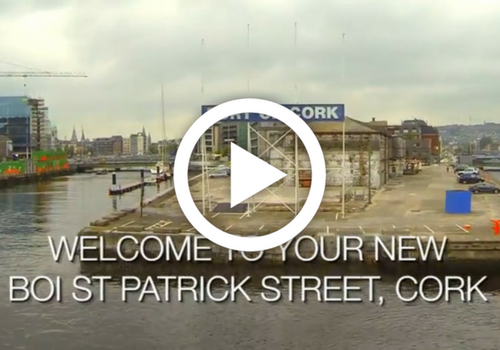 Patrick Street has had a makeover! Now offering free work spaces, meeting rooms, conference areas and event space to all, we actively support the different needs of our local community. Our Workbench area offers startups somewhere to work from, with state-of-the-art facilities including hot desks and complimentary WiFi. Here you can get advice using a support structure that enables you to validate and grow your idea whilst learning from others. And our Events area is available to all – perfect for hosting events and seminars whether it’s for a business, showcasing your products or ideas to potential buyers or a community event for local schools, clubs and charities. We provide full event supports and mentoring from our Cork Startup Community Manager who will be happy to discuss your needs and advise you on what we can offer. We will be running regular workshops and events for business and non- business interests, so keep a check on our calendar to see what’s on over the coming months. Of course, we continue to offer a full banking service – professional financial advice and our self service banking area available for all customers. It is possible to book events out of the above opening hours however this will need to be agreed/scheduled through our Startup Community Manager.